The decomposition of allochthonous leaf litter is retarded by stream acidification, but few studies have evaluated whether this effect can be offset by liming – the palliative addition of calcium carbonate either to streams or their catchments. We assessed the response of litter decomposition to pH and experimental liming in Welsh upland streams. Small-mesh (<335 μm) litter-bags containing common beech (Fagus sylvatica L.) were submerged in main river sites along the River Wye, and in replicate acid, circumneutral and experimentally limed tributaries (all n = 3) for 20 days. Beech decomposition was inhibited in acid tributaries and main river sites compared to circumneutral tributaries. Despite having only moderately increased pH relative to acid streams, limed sites had increased decomposition rates that were indistinguishable from naturally circumneutral streams. Decomposition rates increased highly significantly with pH across all 12 sites studied, and values were near identical to those in more prolonged experiments elsewhere. There were no significant variations in shredder numbers with decomposition rate, and no evidence that sites with faster decomposition had smaller shredder proportions. Although based on short-term observations and leaves from just one tree species, these results are consistent with the well-known retardation at low pH of some aspect microbial decomposition (e.g. by hyphomycete fungi). 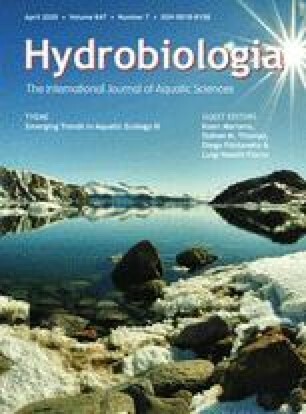 They are among the first to suggest that stream liming to combat acidification might reverse such impacts of low pH. Further data are required on the microbiological causes and ecological consequences of altered detrital processing in acid-sensitive and limed streams.